Purchase DUME Bath Crystals right here! 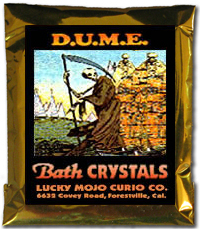 I just wanted to be clear about D.U.M.E bath crystals and that they are not used for bathing for cleansing but rather to sprinkle in the path of the enemy's walkway to be walked over or around it, right? I also wanted to ask if it would be alright to diffuse the bath crystals in boiling water to be poured out in the enemies walkway as well? Correct, this type of Bath Cyrstal is not for cleansing at all. D.U.M.E. Bath Crystals, and this line of products, is for some serious cursing. Be it to "baptist" a doll baby of your enemy, to sprinkle the water mixture on a "gift" made of fabric to name a few. You could use the fixed water with the bath crystals to fix your enemy's walk way as well. Would you be able to suggest how often to use these bath crystals when splashing them all over the walkway of the enemy? I like to do it as often as possible!! But, if it rains hard, I would certainly go back and spray again. I am impressed by your persistence!! Would it also be alright to also mix goofer dust and some sulphur powder in with the D.U.M.E bath crystals as well? Seeing that you said that you would do it as often as possible I think I will have to order another packet of D.U.M.E bath crystals to wash down the driveway now that the candle work is practically done now.